Would you say you had a plethora of dice? Many geeks do, having anywhere from a set or two of the seven traditional polyhedral dice to having bags of the stuff, where they end up being the ones supplying dice to everyone at the table. Perhaps you even have a special die or two that have special meaning or purpose. Or your favorite one. Or your lucky one. But my guess is that most of you don’t have dice like these. 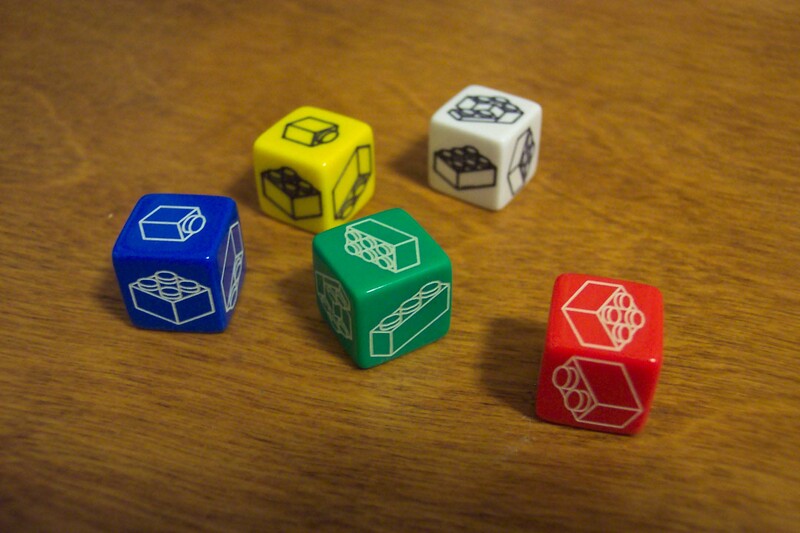 Eric Harshbarger makes special dice on demand. 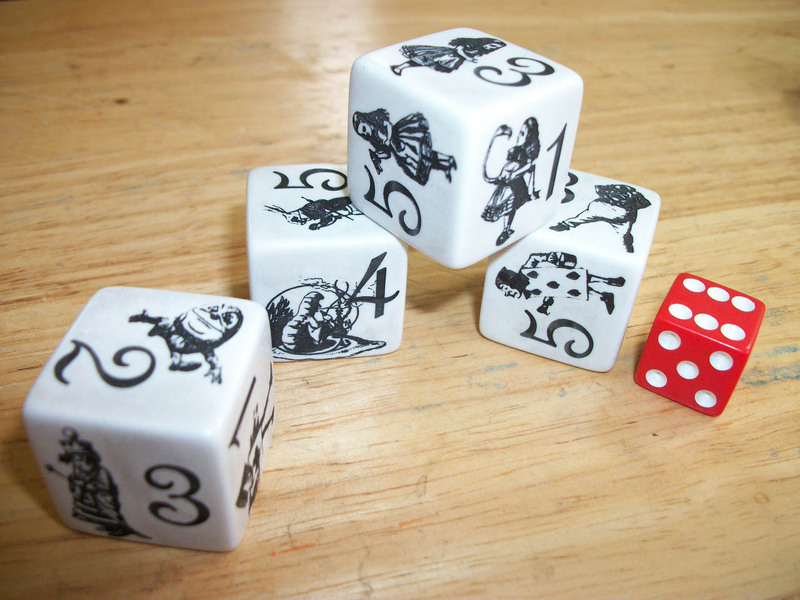 He has a wide variety of custom dice available to order, including the pictured Alice in Wonderland dice that are larger than average (one inch on a side). A very few of Eric’s dice are usable for regular number rolling needs, but most of them have special faces for special purposes. Visit his website for more photos and to figure out what your inevitable order will cost. I liked the look of the dice from the first time I saw them, and as I was scrolling down, I was hoping to find something there that I could justify buying. There were plenty that I would have loved to have–especially the Alice in Wonderland dice–but just didn’t need. Until I got to the pentomino dice. I suppose I’d seen pentominoes at various times in my life, but when I read Chasing Vermeer a couple of years ago (I love young adult fiction), I was shown just how cool they were. (Pentominoes have a high profile in the book. The other books in the series, The Calder Game and The Wright 3 , are also very good.) I knew my son would enjoy playing with them, so I made sure he got some for a gift one year. And when I saw Eric’s pentomino dice, I knew that my son (and daughter) could make up all kinds of games with the dice and the pentominoes together. Since at that point I was definitely placing an order, I looked to see what else I might want to include. 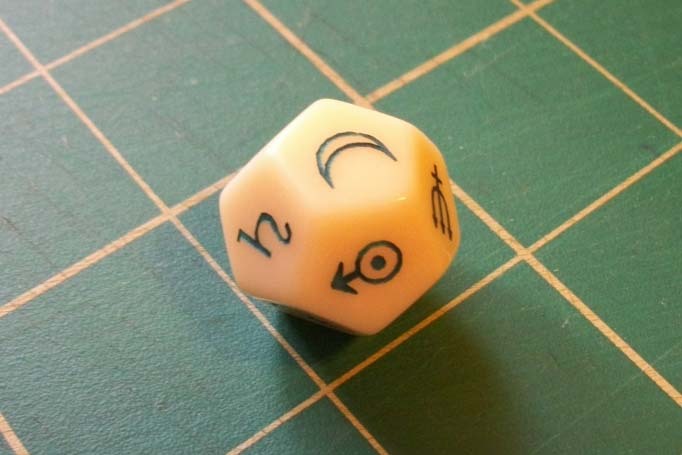 While I wanted one (or ten) of just about all of his dice, I settled on one solar system die, which is smart enough to include Pluto. I’m sure I’ll use this to make up astronomy games, or to add a random element to my writing or teaching. Plus, you know, space. In the end, I traded Eric a review for the dice, but I would have happily paid him for them. I had a choice between white and ivory for my dice, and I chose ivory. The ink is black and pretty clear. The markings on each side are just slightly recessed. They aren’t 100% perfect, but they are hand-made, and you can tell they are made with care. They feel very nice in my hands. Also, my boy has now lost himself in a pile of his pentominoes and the new dice. He’s invented games for one to four players, and these dice add a whole new dimension to his creativity. I’m extremely pleased with both the dice themselves and the additional elements they bring to play and education. My new dice have earned a solid place in my slowly growing dice collection, and Eric’s website will be my first stop for any custom dice needs I have in the future. I highly recommend his products to everyone with custom dice needs, or even just wants. You’ll find a use for them, I promise. 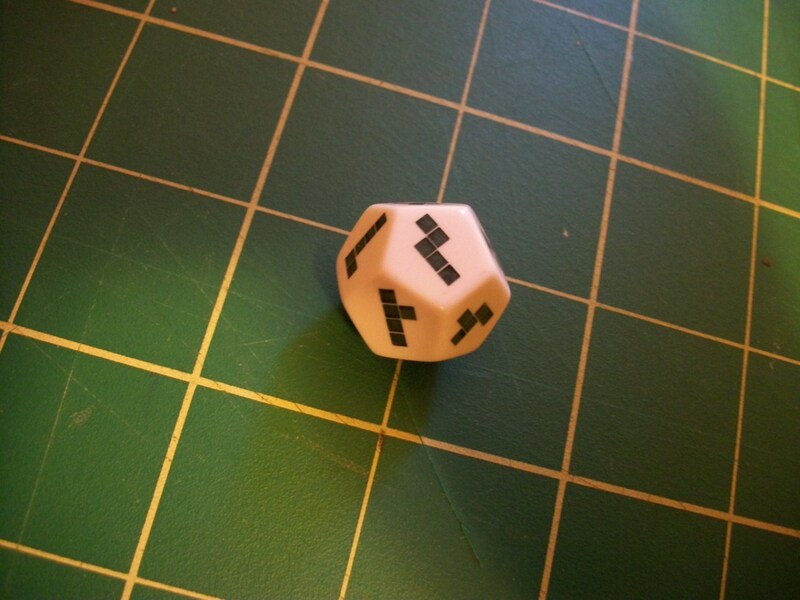 The price of Eric’s dice ranges from $2 to $5, depending on faces, ink, and size. Since he makes them himself, he is able to ship them out very quickly. I received mine three (3!) days after ordering. Your experience will, of course, depend on Eric’s availability at the time. Check out Eric’s dice offerings (you may also be able to talk him into creating wholly custom dice for you), and expand your own collection! Note: I received five dice for the purposes of this review. Additional Note: I first learned about Eric’s work from this GeekDad post.